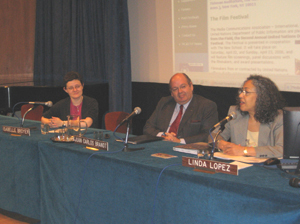 On April 13, 2006, a week before the second annual Stories from the Field film festival, MCA-I communications chair, Linda Lopez, and her counterpart at the UNDPI (United Nations Department of Public Information), Isabelle Broyer, gave a briefing at the United Nations for an audience of international NGO (non-government organization) representatives. The briefing was moderated by Juan Carlos Brandt, chief, DPI/NGO Section, United Nations. Broyer and Lopez made their ad hoc presentation at the end of the regular proceedings, a discussion on Changing Realities: Indigenous Peoples in the Next Decade. The audience was given a brief history of the Festival, which was founded in April 2004 to share with New York audiences the stories of United Nations field workers and the communities they serve, and to celebrate the Millennium Development Goals. After a successful first year, the Festival was opened to public filmmakers, as well, whose work reflected one or more of the eight Goals. This year, the Festival judges selected 40 films for screening, from a field of 180 submitted by UN and public filmmakers on five continents. Submissions ranged in length from 10-second promos to one-hour documentary films. 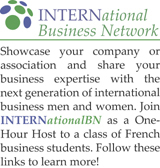 The Festival is presented in cooperation with the United Nations Department of Public Information and is held at The New School. A Webcast of the NGO briefing may be viewed at http://www.un.org/dpi/ngosection/spring06/briefings/brief-april13.htm. The Festival segment begins at approximately one hour and 16 minutes into the one-hour and 43-minute program, and can be accessed immediately by sliding the console dial to that spot in the program.